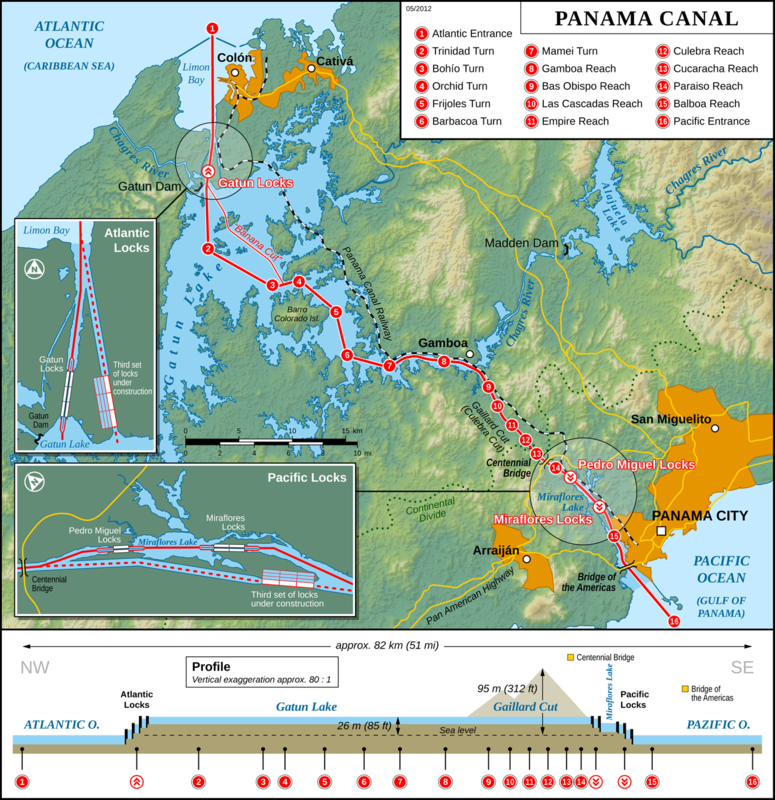 The length of the Panama Canal is 77 km. (48 mi). A ship takes an average of 8 to 10 hours to transit the Panama Canal. Ships wait in the Limon Bay for permission to start their voyage through the canal. 8.7 km to the canal. Underway you might stop at Colon, depending on your itinerary. 3.1 km to the Gatun locks, a three-stage flight of locks 1.9 km (1.2 mi) long, lifts ships to the Gatun Lake level, some 26.5 m (87 ft) above sea level. An average 10 story building is the same height! 29 km through the Gatun Lake, an artificial lake formed by the building of the Gatun Dam. 8 km through the Chagres River, a natural waterway enhanced by the damming of Gatun Lake. 12.6 km through the Culebra Cut, which slices 12.6 km (7.8 mi) through the mountain ridge, crosses the continental divide and passes under the Centennial Bridge. 1.4 km through the single-stage Pedro Miguel lock, which is 1.4 km (0.87 mi) long, is the first part of the descent with a lift of 9.5 m (31 ft). 1.7 km through the artificial Miraflores Lake. 1.7 km through the two-stage Miraflores locks, is 1.7 km (1.1 mi) long, with a total descent of 16.5 m (54 ft). 13.2 km passing under the Bridge of the Americas, to the Pacific Ocean. The transit through the canal costs your cruise company $134 plus extra's per person. A typical 2000 passenger ship pays about $400,000. At the moment only Panamax size ships are allowed. 110 ft (33.53 m) wide, 1,050 ft (320.04 m) long, and 41.2 ft (12.56 m) deep. The height of the Bridge of the Americas at Balboa is the limiting factor on a vessel's overall height; the exact figure depends on the water level. When ships are going through the locks they are accompanied by 8 mules, heavy electric locomotives. Not to pull them, but to keep the ship straight while in transit. With as little as 2 ft (60 cm) of clearance on each side of a ship, considerable skill is required on the part of the operators. In 2016 expansion of the Canal has been completed and will allow for larger ships.